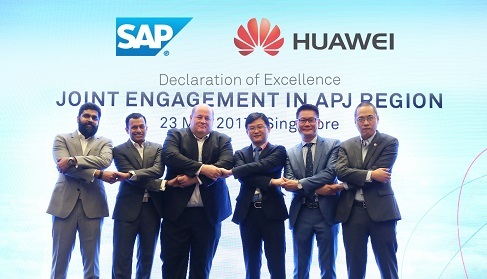 [Singapore, June 6th, 2017] Huawei unveiled a joint engagement partnership with SAP, following a declaration of excellence ceremony at the Huawei eco-Connect Singapore show, in conjunction with CommunicAsia2017 held at the Marina Bay Sands. The partnership will allow both parties to explore new opportunities in the Asia-Pacific and Japan region in the areas of Big Data and analytics, Smart City, Safe City, Internet of Things (IoT) and cloud. Huawei aims to expand its existing collaboration with SAP on the SAP HANA® platform running on Huawei’s cloud virtualization platform FusionSphere 5.1, in a bid to support customers’ success. The partner ecosystem is a critical factor in Huawei’s strategy and solutions for vertical industries, particularly the public sector, telecommunications, utilities, transportation, manufacturing, education and healthcare, bringing high-speed computing to address business needs for real-time data processing and analysis in the new era of the cloud and Big Data. “Huawei's business positioning is focused on being the best partner to enable a digital society, to create an open, flexible, secure and agile information and communications technology (ICT) infrastructure platform, in alignment with SAP’s strategy and solutions. By building a win-win ecosystem and collaborating extensively with SAP, we plan to further explore opportunities together in various areas and help customers in various industries achieve success in digital transformation,” said Lim Chee Siong, Chief Strategy and Marketing Officer of Huawei Southern Pacific Region. Huawei and SAP have a long-standing partnership working together on the SAP HANA platform, cloud, Big Data and IoT solutions, now in place at more than 500 clients globally. A co-innovation centre was established in 2015. Both companies continuously invest in ICT innovations and create more technical synergies, leading to enterprise solutions designed to bring value to an increasing number of industries and markets. The Huawei eco-Connect Singapore is an inaugural gathering of key industry players to learn, share insights and experiences, forming alliances, as well as matching business opportunities for the development and sustainability of this ICT ecosystem. At the Huawei eco-Connect, Huawei showcased a number of industry-specific solutions including an IoT connectivity product for advanced metering infrastructure of smart grid, smart manufacturing and private cloud services for the telecom industry. These solutions address the challenges in industries’ digital transformation, helping enhance business agility and the customer experience with innovative technologies from Huawei, SAP and their respective ecosystem partners.